Life is unpredictable, and you never know when disaster can strike. Accidents and incidents can happen anywhere, at anytime. Road traffic accidents are one of the top ten causes of death worldwide, and the number of heart attacks each year is increasing. Preparing yourself for disaster or an emergency situation by taking a First Aid course can really make all the difference between life and death. Indeed, it’s those vital first minutes that are the most crucial in an emergency situation. ​If you’re not already convinced that learning the basics of First Aid is a worthwhile pursuit, then consider these two key reasons why everyone should know the basics of first aid. Unfortunately, accidents can — and do — happen, everywhere. When they do, it’s those first few moments after an incident that are crucial to whether the person survives or not. 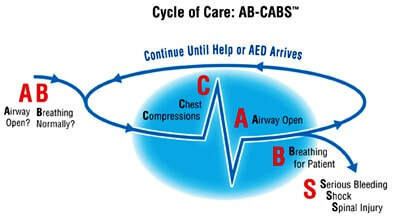 Knowing how to perform simple procedures to keep a person breathing and how to administer basic treatment to stop a person from bleeding excessively, can help save a life, or at least reduce the severity of an incident until professional medical help arrives. You can learn how to do this by undertaking an EFR Primary and Secondary First Aid Course. A course such as this will teach you all the basics, and give you a working knowledge of why certain procedures work, and what to do in any number of emergency situations. Imagine if it’s someone you know that’s suffered an accident, or is in urgent medical need? ​ Wouldn’t you want to give them the best chance of surviving by performing basic First Aid? Taking a First Aid course can save someone you love from pain and suffering, and even death. ​Having First Aid skills and experience means that no matter where you are, you’ll be able to administer basics to people in need. Knowing that you have the skills to help save a life of those you know or of complete strangers, can give you a sense of empowerment and self-confidence. Learning First Aid will also give you a sense of calm in an emergency situation. Instead of panicking and potentially making things worse, being trained will help you keep your cool and help you make the correct medical and logistical decisions. This is especially important if you’re a parent or a caregiver to someone in need. You don’t want to panic and make rash decisions in the event of an emergency. Moreover, at the very least, learning First Aid means that you’ll know what to do if you’re unfortunately involved in an accident. If you can’t help yourself then you could instruct others on how they can help you. Even from the most self-interested point of view, it’s a useful skill to have. Learning the basics of First Aid is an extremely important and useful skill to carry through life. Knowing First Aid can save lives and limit injury, help your career, and give you a sense of empowerment that no matter what happens you’ll be able to help out in a time of need. Life is unpredictable and accidents are common. Have the peace of mind that learning First Aid can give you, and sign up for a course today. It really can make all the difference between life and death. We regularly run Emergency First Response - Primary Care (CPR) and Secondary Care (First Aid) courses and all our courses include the Automated External Defibrillator (AED) module. If you want us to run a course on your site, for your business or community group, then please contact us to discuss.